Here’s a handy cheatsheet to show you the way Firefall resources are organised. The top-level groupings – Mineral, Gas and Organic – are called Groups. Each group is divided into two Families. Minerals include Metals and Composites; Gases include Reactive and Inert Gases; Organics include Biomaterials and Enzymes. 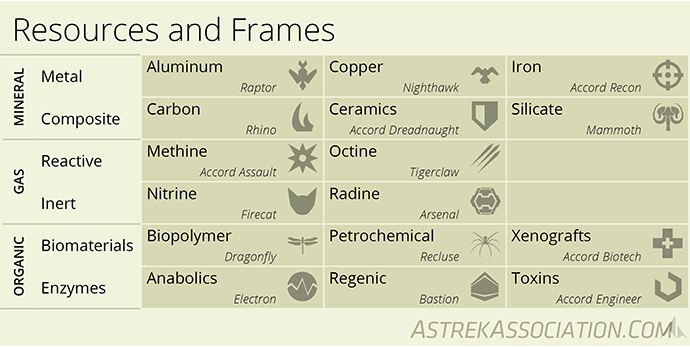 The resource listed for each battleframe is associated with that frame for progression. It used to be the case that you needed bulk quantities of that resource to simply unlock progression boxes. Now you can use more generalised resources (any Mineral for Mass unlocks, any Gas for Power unlocks and any Organic for CPU unlocks), but you still need substantial quantities of your frame’s associated resource to create the progression tokens necessary to unlock the final three boxes of each progression tree. Do let us know if you find our cheatsheets handy, and if there are others you’d like to see just drop us a line with your suggestions. This is brillant. Thank you. I started to do something like this in google docs, but this is just so… elegant. Fantastic! Saves a lot of frantic clicking and note scribbling when trying to figure out how to get those top-tier upgrades! These cheat sheets are perfect.